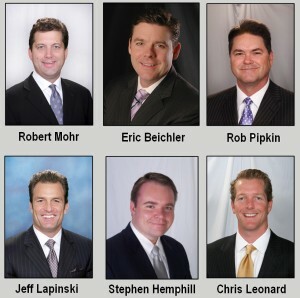 The Dallas Business Journal recently named six Mohr Partners’ brokers as finalists for its 2012 Heavy Hitters in the North Texas commercial real estate community: Robert Mohr, Chairman & CEO; Eric Beichler, Managing Principal; Rob Pipkin, Managing Director; Jeff Lapinski, Managing Director; Stephen Hemphill, Managing Director; and Chris Leonard, Account Executive. The 2012 Heavy Hitters will be honored at a breakfast at the Dallas Convention Center and featured in a special publication of the Dallas Business Journal on March 30, 2012. Lapinski and Leonard were nominated in the category of Industrial Tenant Representation, and Beichler, Hemphill, Mohr and Pipkin were nominated in the category of Office Tenant Representation. Robert Mohr founded Mohr Partners in 1986 with a single office located in Dallas, TX. Now in its 26th year of operation, the company recently launched its twentieth office in the U.S., with plans to open additional offices throughout North America in 2012. Mohr has overseen the company’s growth in becoming one of the largest U.S. based Corporate Services Real Estate firm in the country. Eric Beichler joined Mohr Partners 18 years ago and was promoted to Managing Partner in 1998. As a Principal of the firm, he has been influencial in growing many areas of the company. Beichler was recognized as Mohr Partners’ Broker of the Year in 1997 and 2002, and Partner of the Year in 2005. Jeff Lapinski joined Mohr Partners 15 years ago and has consistently been among Mohr Partners’ top producing brokers each year. In acknowledgement of his production, leadership and hard work, Lapinski has been named Mohr Partners’ Broker of the Year on multiple occasions, including most recently in 2010. Stephen Hemphill joined Mohr Partners in 2003 and has brought exceptional value to clients during his tenure. He is known for his ability to quickly assess clients’ needs and offer imaginative solutions using the Mohr Partners business model. In 2010, Hemphill was ranked #5 in the Dallas Business Journal’s Top 35 Brokers Under 35 listing. In recognition of his leadership and hard work, he was named Mohr Partners’ Mentor of the Year in 2006 while serving as a Co-Manager of the Business Development Group Department, and Broker of the Year in 2007. Chris Leonard joined the company in 2004. During his tenure, he has elevated himself to Account Executive and developed a business that consists of over 17 million square feet of national portfolio real estate under management. He was named as a D CEO Power Broker in 2010 and 2011.